I love to read Saint Paul. To me, his letters are full of loving concern for the churches - the various communities around the known world that he fathered in the Name of Jesus Christ. To me, Saint Paul is very real, very human. Perhaps that is why some people aren't too crazy about his personality. We are very familiar with Saint Paul because we read from his letters (epistles) for a big chunk of the liturgical year. During Pascha we will read the Acts of the Holy Apostles and at other times we might hear from the short letters of Peter or James or John. On certain important holy days we also hear from the unnamed writer to the Hebrews, which some ascribe to Saint Paul, too. Much of what we are familiar with is from Saint Paul. And then, live on it that joy! Today is indeed a festive day. We do not make special mention of the Resurrection on this Sunday before the Resurrection. We celebrate a feast of Christ - His triumphal entrance into the holy city of Jerusalem. As He was greeted by the Hebrew children with palms and branches and shouts of "Hosanna!" we also carry palms and branches of pussywillow and sing "Hosanna!" to our King. I am also emotional on this day. 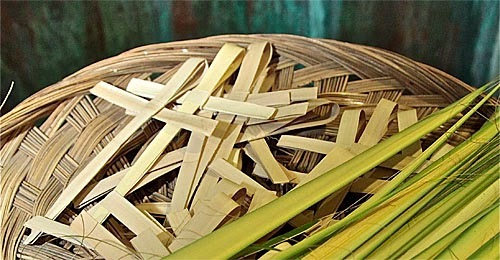 For those of us raised in the Church, the celebrations of Great and Holy Week are not only beautiful and moving, but also very familiar and bring back a lot of memories. I remember priests and people from my home parish and from my time at Saint Basil in Texas. I remember the singers, the servers, those who formed processions, and the Babas walking to the grave on their knees. I remember a lot of loved ones who have gone to celebrate the Paschal Mystery where it is known fully, and where they are known fully. I know that you remember, too. As we walk one more time through the streets of Jerusalem with our Lord, our Lady, and the faithful women, remember those whom you love who helped to make your memories. Say a prayer or light a candle for them. Know that they pray for us and love us, too. May your Great and Holy Week be blessed! The above reflection was written by a priest who serves the people of Pennsylvania.